If you’ve just starting planning for your vacation or holiday in Iceland, check out our Iceland planning and resources post. NOTE: Our itinerary outlines activities and drive times. Everybody has different eating habits so stop for groceries and food as needed. Picnic areas are suggested when extraordinary, otherwise eat where and when you want. We rarely ate out and instead enjoyed yogurt and fruit for breakfast, prepared quick lunches and snacks throughout the day, and cooked a hot meal every evening at the campground. When we planned our Iceland itinerary we had anticipated spending today hiking to the Glymur waterfall. However, as we went to bed last night in Mitzi, our Kuku Camper, we realized how much we wanted to see even more of the ‘fire and ice’ landscape that captured our hearts hiking at Landmannalaugar and Þakgil. On the cover of our Lonely Planet guide book was the exact sort of place we were dreaming about. And so it was decided. We’d spend one of our last days in Iceland hiking in the Hveradalir area of Kerlingarfjöll. TIP: If you do not have a 4×4 vehicle then you can stick with our original plan. Instead of Kerlingarfjöll, Hveradalir, and Hveravellir Nature Reserve, plan to spend the day hiking to the Glymur waterfall and stay the night at Mosskogar Campground referenced on Day 12. NOTE: 4×4 is required to access the Kerlingarfjöll area. It’s going to be another MAGICAL day (albiet with long drives) so get an early start. From Akranes Campground it’s a 3 ½ hour drive to the Kerlingarfjöll Mountain Resort. TIP: On Day 12, we suggest staying at the Mosskogar Campground (instead of Akranes Campground) if you’re planning on visiting Kerlingarfjöll. The Kerlingarfjöll Mountain Resort is a slighter shorter 3 hour drive from Mosskogar Campground. The drive includes the F35 as well as 30 minutes on the F347 road, both require 4×4 drive. TIP: Like other interior Highland regions of Iceland, there is no fuel or services near Kerlingarfjöll. Get petrol whenever possible in Iceland. Upon arriving at the Kerlingarfjöll Mountain Resort, pack yourself a lunch and put on your hiking shoes. There are various facilities at the resort but their availability will depend upon the time of year. If nothing else, find the posted trail maps and take photos so you’ll have a map. 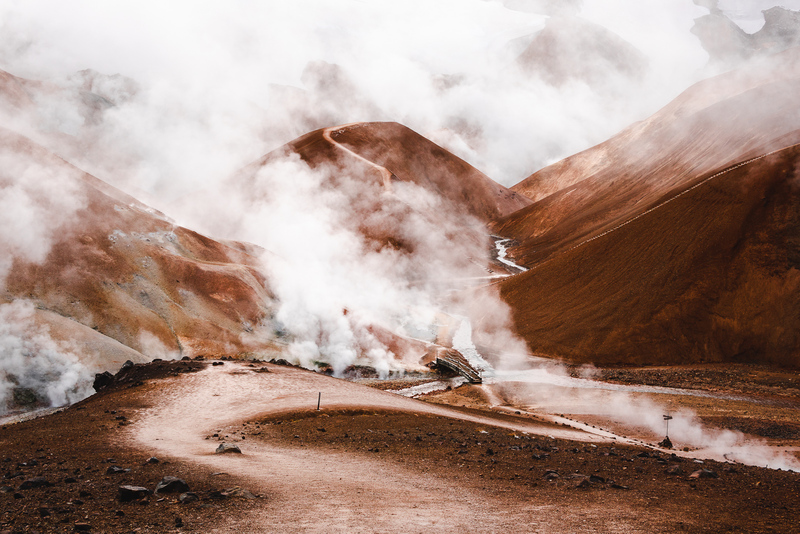 Kerlingarfjöll is a stunning mountain range that is both full of color and geothermal activity. Like Landmannalaugar the mountains are rhyolite and some of the mountain peaks are topped with small glaciers. Hveradalir, “Valley of Hot Springs”, is the region of Kerlingarfjöll that we’re going to focus on hiking today. It’s possible to hike to the Hveradalir area from the Kerlingarfjöll Mountain Resort but we recommend driving the additional 10 km to the upper parking area. Once you arrive at the Hveradalir parking area, you’ll be in awe. There are geothermal rivers and mud pots below snow-capped mountains. Literally ‘fire and ice’. Love it. Descend the stairs and spend 4 – 5 hours exploring the region. TIP: Watch your step. The ground is similar to a clay-substance and can be extremely slippery when wet. There’s a circular hiking route around the geothermal features as well as a hiking path that climbs up and around the mountain to your left. After enjoying such solitude and majestic beauty at Kerlingarfjöll / Hveradalir we were extremely reluctant to leave the interior Highland region. If you agree, return 30 minutes to the F35 junction and then push on for another 1 hour of driving to Hveravellir Nature Reserve. The Hveravellir Nature Reserve is a geothermal area, like a mini Yellowstone National Park in Montana/Wyoming, United States, but with the bonus addition of a man-made hot spring for soaking. Spend 1 ½ hours walking the boardwalk to view the geothermal features and soaking in the hot pot. There’s also a restaurant on-site. TIP: There is a 500 ISK facility fee that covers the use of toilet, showers, and hot pot. However, you may wish to instead spend the night – 1900 ISK per person for a campsite – which includes use of the facilities. You’d be correct if you thought we already stayed at Skjòl Campground. We stayed here on Day 1. Skjòl Campground is a 2 hour drive from Hveravellir Nature Reserve. We would have stayed the night at the secluded Hveravellir Nature Reserve but, as luck would have it, there was a chance of seeing the aurora that evening across the majority of Iceland – except for the Highlands region. After seeing the aurora on Day 11 we didn’t want to miss a second viewing so we decided to make the 2 hour drive back to Skjòl Campground. This decision paid off and we saw the Northern Lights during our drive to Skjòl Campground. We pulled over and watched the sky do a beautiful waltz. The Hveravellir Nature Reserve Campground would be a perfect place to crash after soaking in the on-site hot pot. A campsite at the Hveravellir Nature Reserve costs 1900 ISK per person and includes use of the facilities. TIP: Tomorrow we’ll be spending the day in and around Reykjavik. We prioritized the outdoors during Iceland but if you wish to have more time in the capital city of Iceland then driving to Skjòl Campground tonight will save 2 hours of driving tomorrow morning. Day 13 covers points 64 – 66 on the map layer Our 2 Week / 14 Day Itinerary. Other layers include additional points of interest, accommodation (camping and hotel), and dining/groceries. Most of these points have a description and a link for more information.